Now that Halloween has passed, it is time to start thinking about winter coats, Black Friday and balsam trees. Dining table centerpieces can be cheap and easy by using items you already have at home or in the garden. Embrace the holidays by using natural finds like pumpkins, gourds, berries, branches and leaves. 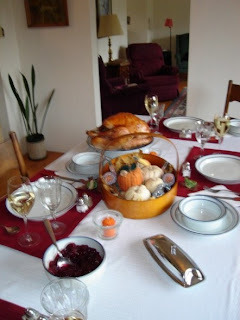 I talked about my 2009 table centerpiece for fall in this post. Full disclosure: the centerpieces highlighted in this post are my mother's brainchild (brainchilds? brainchildren?). All I had to do was head up north for the holidays and take the photos, so thanks Mom! Looking forward to seeing what you have planned for this year! In the above picture, we've got 2 small pumpkins hollowed out as vases for cabbage leaves and wildflowers. 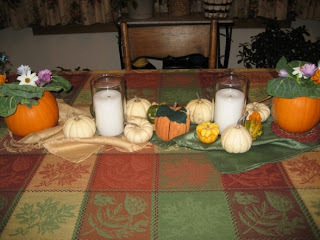 Gourds and baby boos (little white pumpkins) surround two white pillar candles. You could also gather up the items and place them with leaves in a basket with a couple votive candles on either side. Mmm. . .I'm starting to get hungry looking at that turkey! I thought I'd also add in a quick place card idea. 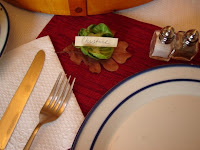 We do not really need place cards for our family holidays since we typically max out at 6 people at the table, but I got inspired when my mom was making her brussels sprouts dish (an excellent recipe I look forward to sharing with you). I used one of the shells and wedged in a piece of cardstock with the person's name written on it. Setting it on a fall-colored leaf added a little extra something. Oh, but we're not done yet. . .stay tuned in the coming weeks for more holiday centerpiece ideas for Christmas and New Year's!